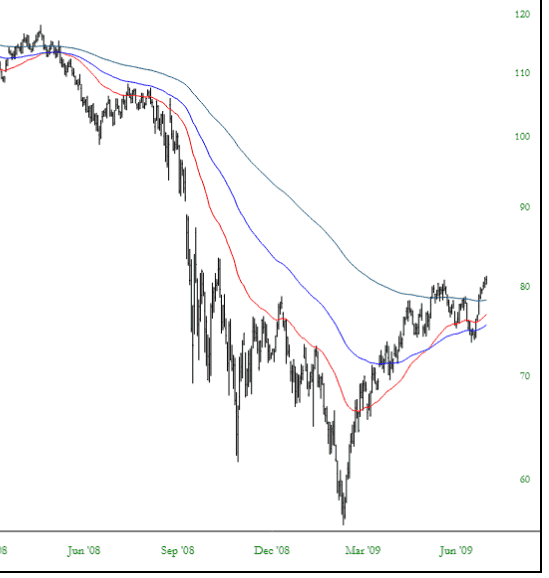 Moving averages are the best-known, most popular technical indicator. They represent price data in a “smoothed” fashion, showing a simple line graph overlaid on the price chart based upon recent price data. The amount of recent data used is controlled by you: a 10-day moving average, based on very little data, would tend to be volatile and would cling closely to actual price data, whereas a longer-term study, such as the commonly-used 200-day moving average, would move more slowly and smoothly and lag price data far more. 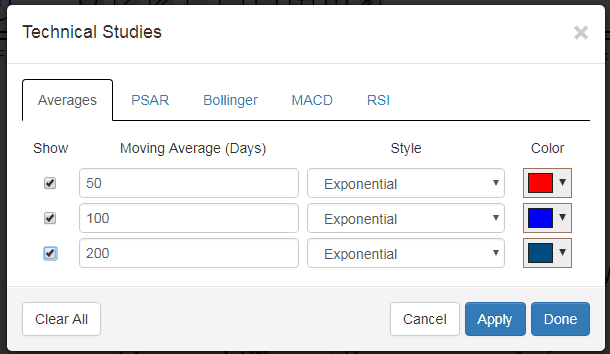 In the Technical Studies dialog box, you have several points of control with respect to moving averages: (1) whether to display one, two, or three of them (2) how many days should be used as the basis for computation (3) whether each should be Simple or Exponential (4) what color each one should be. You can also reset all of these by clicking Clear All. Most of these are self-explanatory with the exception of “Simple” versus “Exponential”. Briefly stated, Exponential moving averages place a greater weight on recent price data, whereas Simple moving averages treat all the price points with identical weighting. Therefore, exponential averages tend to react more swiftly to recent price activity. Below is an example of a chart with three moving averages. Although not shown here, a legend is provided in SlopeCharts showing the meaning of each colored line (as to whether it is simple or exponential and how many days are used) as well as the value of each of these lines are whatever place you are pointing on the chart. You can use any positive integer as the basis for days. Below, for instance, are some very-long term moving averages, based on 200, 500, and 700 price bars each. The legend for these, as well as the values, is shown at the top of the chart. 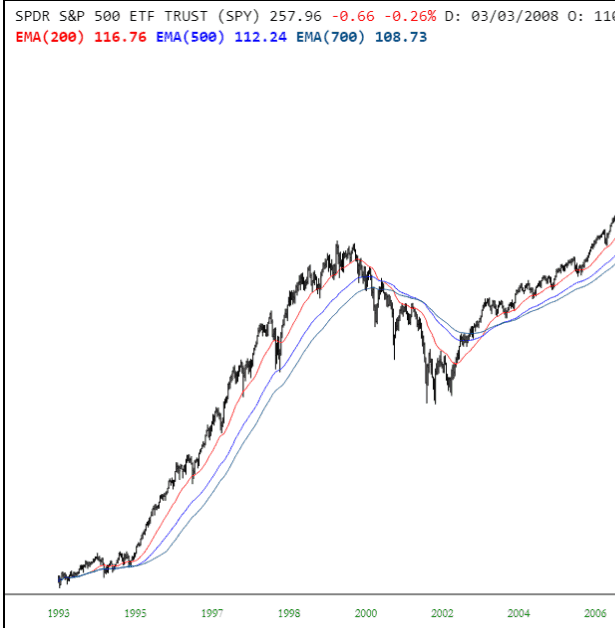 This is a very long-term chart of SPY, and the smooth progression of the three moving averages, coupled with the steady amount of space between them, shows what a consistent bull market there was for most of the 1990s. People using moving averages in different ways. One common use is to look for them as an important level of support. 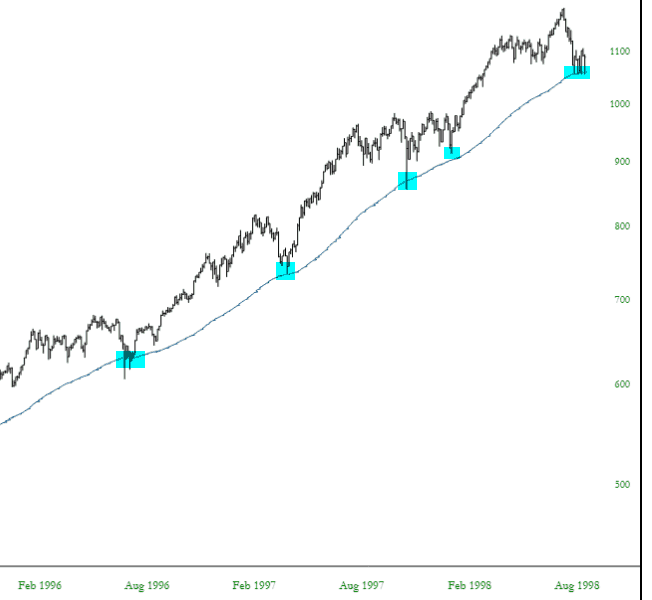 Here, for example, is the S&P 500 index with a 200-day moving average. 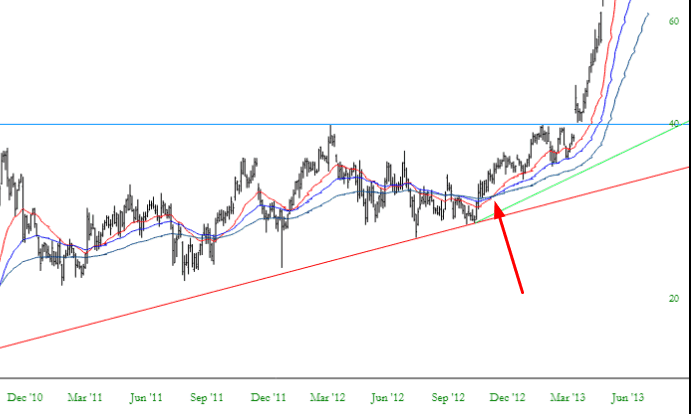 Each time the market entered a period of weakness, it tended to find strong support at this average. More commonly, traders look for instances of “crossover”, which can suggest a change in trend or, in the example below, an affirmation of strength. The chart below is of Tesla Motors (TSLA), and although the stock had been directionless for years, once the moving averages did a clean crossover, with the faster averages clearly crossly above, and staying above, the slower ones, the stock began its amazing ascent.